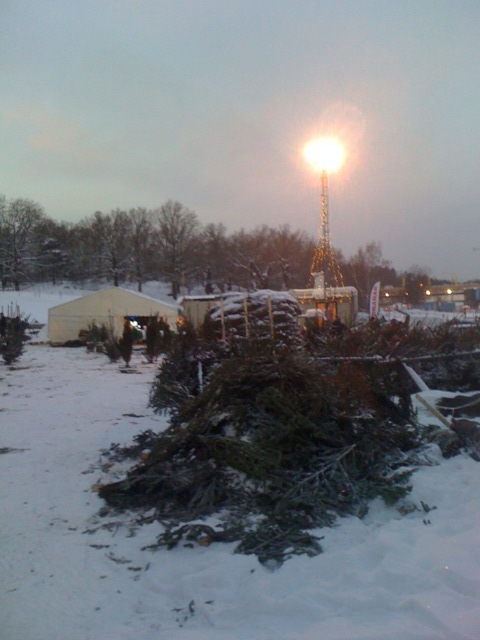 We usually go to a park or the big,long street - Karlavägen - where they sell trees at various points. So this year we decided to walk a little bit further away and shop a cheaper tree. It's quite fun to walk away with the whole family and fetch the X-mas tree! But of course it's possible to order in advance and get it delivered.Very convenient! When we had selected our tree,we negociated the price a little,then we asked them to cut off about 20 cm of the trunk at the bottom and then put a net "stocking" on,to make it easier to carry. One important point is to not immediately bring the tree from outside to the interior of a warm flat.Our tree is now resting over night with the trunk in a bucket of water outside our door.Tomorrow we will bring it all the way into the flat and decorate it!